We recently visited an aquarium while on vacation. Aquariums aren't Ella's cup of tea. She enjoys activities that involve yelling and walking and throwing toys at her brothers. She doesn't enjoy activities that involve sitting in a stroller and looking at fish for 3 hours straight (much unlike her dad and brothers who can stare at fish for hours on end). Ella letting me know fish bore her.. I was able to find a play area in the aquarium. It had soft climbing toys in the shapes of Nemo and pirate ships, a mini slide perfect for Ella sized little ones and other little kids to hang out with. She was a happy baby again. When I entered the play area there were 6 little ones on a play date with their moms. The kids were 1. typical developing kids 2. dressed as if the baby gap had just finished a fashion show and these were their models 3. running around like crazy 4. talking 5. younger than Ella. Now, these 5 things might not seem like a big deal to most people but to me, they set off my "Down syndrome Mommy radar". Well - maybe not #2, that set off my "Stop shopping at target and dress this adorable kid cuter radar" - but the other things made me sad - a right away sad. And then, feeling sad made me feel angry because Ella is a perfectly fine little girl developing along a normal scale for her so why the hell am I sad that she isn't like these kids? I tried to brush it off and enjoy that Ella finally wasn't screaming and Mike got to look at his spotted puffer fish in peace, but then - this happened. Mom #1 to me "How old is your daughter?" Me - after a way to long pause that might have made it appear that I recently kidnapped her and don't really know her birth date - "Umm she is (insert mumble) 20 months." Mom #1 - "Oh, well, Oh, she's cute for her age". Me - "Yeah, she sure is." Mom #1 then leaves the pirate ship Ella had overtaken and went back to her mommy friends. Mom #2 then comes over, tells me how cute Ella is and then tells me her 30 lb talking, running, apparently able to add and subtract and keep a hat on his head child is also 20 months. She asked when Ella was born and if we were from Charleston. She kept staring at Ella, she kept trying to get her son to interact with her. Now - this is where any other mom would probably have said - She was born on February 16th AND she has Down syndrome. Thus eliminating all questions from the mommy group as to why my daughter didn't stack up to their 20 month olds. I didn't say it. I don't know why. I just said her birthday was in February and we were from Phoenix. I didn't leave the play area, but I did start to tear up. I am pretty sure the mom thought I was crazy. She went away, Ella kept playing and all was fine, but I wasn't. 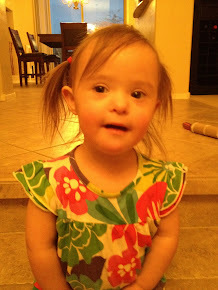 I am in no way ashamed that Ella has Down syndrome. I am not afraid to tell people, I am not afraid to talk about it or show off the "markers" that make her - her. I seek out others who have kids with DS to talk to, to relate to, to learn from, but when it comes to moms of kids her age that don't have DS. I just don't feel comfortable around them. I should have told her Ella had Down syndrome, I should of used it as a learning experience for both the moms group and me. I should have done a million things instead of feeling sad and then angry, but I didn't. I didn't want to tell this mom. I didn't want to discount Ella to them. I didn't want Ella to have a reason to be different. I wanted her to just be 20 months old and that's it..
Now, this is irrational at best, obviously the moms knew there was something that made her different. Telling them isn't discounting Ella, it is being honest and upfront and proud of my daughter. No matter what Ella is - she would still be 20 months old, so telling them wouldn't of changed that, it would of just clarified things. I just didn't want them to pity her or and this sounds horrible - be thankful their kids don't have Down syndrome. I didn't want the 3 moms to go back to their huddle and say - "I am so glad that isn't us.." Because if they really knew us and Ella they wouldn't say that but they don't know us so maybe they would say it. I lost an opportunity to share about Down syndrome and Ella. I let my own insecurities get in the way. This was the first time I had really been in this situation and it was uncomfortable. I was caught up in watching the other kids walk and talk and run and use straws and I forgot that my little girl is just as amazing in her own ways and that those other little kids and their moms might have their own struggles and I just need to be me and let Ella be Ella and all will be OK..
Next time we are out and this happens, I won't react the same way. It's my promise to Ella. I went through similar scenarios to yours when my older daughter (she has cerebral palsy) was young. I always felt like I was explaining everything, and it frustrated me that we couldn't just "be" when we were around strangers. Now, with Nathan, I don't feel as much pressure to do that anymore. My little guy is uber-cute, but I also know that sometimes people tell me he's cute so that I'll tell them what's "wrong" with him. If I sense that they sincerely are interested, not just nosy, then I'll share. Otherwise, I wait for them to ask. I feel like if I volunteer information that they haven't directly asked for, then I'm emphasizing something that I don't want emphasized. Just my two cents. :) Visiting via the blog hop! Blog hopped over. You have cute daughter. Don't beat yourself up, there is no right or wrong action in that situation. Sounds like those mom's actually embraced your daughter as a person and you gave them an opportunity to see her as just a kid playing. That's worth something right there. I know the feeling all too well. I'm afraid mine is about to get worse because my sister and sister-in-law are both expecting babies soon. They will be a year behind but I know they will get compared. I think it is human nature to compare....she is absolutely beautiful! Sorry she was less than impressed with the aquarium! Hopping by.. just wanted to say hi! And don't get too down on yourself for not saying something different to the moms. If you're anything like me you'll find a comfortable little "speech" of sorts for those situations as time goes on, just the basic response that shares just the right bit of info while focusing on how great your little cutie is. As crazy as it sounds, I now find it fun to tell people (parents of typicals) how old Braska is and tell them about DS, because it's always such a surprise (Most almost 5-year-olds are more than 26 lbs for starters, and they don't usually look like a twin to their 2-year-old sisters! :o) And because they then get a great and positive picture of what DS means. I just wanted to say hi. I've been here before but never left a comment. Thanks to the blog hop I'm back! I struggle with whether to tell or not tell and have regretted not telling too. Happy blog hop! Just hopping by! and yup, it was a long time ago.... but i remember a similar day. I found each day, each encounter was different, depending on the setting, depending on me and where I was at (usually fatigue-wise..... which ended up meaning emotion-wise :) , depending on the other moms. Don't beat yourself up........ take care of yourself..... you've got plenty of time to "share". Blog hopping tonight......I am so glad I found you! Don't be hard on yourself. We have a lifetime of educating others ahead of us - haha. Blog hopping (late!). Don't worry, we have all been there. That comparison thing bites. It is so hard not to get caught in it. But, share if you want, don't if you don't want to. You don't owe other moms an explanation.... Your daughter is adorable and your blog is so cute! :) Loved reading your post. And you know when I am around kids Russells age and I see them walking around it does sting a bit...But then I remember Russell seems so normal for Russell so who cares? Anyway...Ella is adorable...AT ANY AGE! I love when you post!! I so know how you feel, I've been there many many times! Your Ella is a doll!! Blog Hopping led me here - YAY!!! I admire your honesty in this post!!! Thank you so much for sharing!! Hi there! Blog hopping! Yes, I am terribly late--looks like I will be doing the blog hop thing for the next week to get them all in! Anyway, don't be so hard on yourself about the mall incident with the mommies. You are Ella's mom and there will be plenty of time to share that if you should choose to. I use to wonder when Katie was younger if they could tell she had Ds. I wouldn't say anything, but now my conversations usually has a Down syndrome statement in it. Most people could tell anyway when I would say she had Down syndrome--they would be like yeah, I could see that. She is first and foremost your daughter, just like the rest of those children are their kids. And you did share, you shared that your daughte loves to play just like everyone else and they could see that. Hugs!